The problem faced by most home and property owners is that moisture behind walls, over ceilings, and under floors is often impossible to detect until the problem is excessive and visible to the naked eye. Since the investigation and removal of infestations of not yet visible mold in structures is often difficult, technology is now being used to do what once was impossible. Locate and pinpoint hidden water intrusion and leaks with non-destructive thermal technology. Immediate documentation of water damaged structures, plumbing and building envelope water leakage, post -flood and energy use inefficiency. According to the U.S. Environmental Protection Agency, there is no practical way to eliminate mold spores in an indoor environment. The best way to control mold growth is to control moisture. Mold can begin growth in as little as 24 hours. 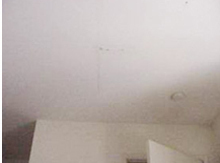 Roof leaks and water pipe leaks are common sources of water accumulation that may cause mold growth. A mold problem is a moisture problem, so when thermal technology is used to find moisture, and it actually finds moisture, it becomes possible to prevent mold and rot from taking hold or to remove the mold that actually grows. 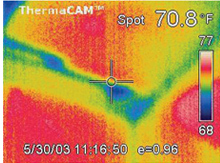 The thermal image (left) clearly shows a leaking bedroom ceiling (visible, right). The leak was assumed by the owner to originate in an upstairs marble-paneled bathroom in the $3 million home. The estimated cost to rip out and replace the marble to access the plumbing was estimated at $80,000! Further IR investigation absolved the bathroom and traced the source of the leak to a clogged weep hole under the threshold of a door leading to an upstairs porch. This thermal image of vinyl-sided 3-floor apartment house clearly shows the path of a serious leak from a washing machine on the third floor, which is completely hidden within the wall. After any water damage event like a Hurricane, flood, broken water lines, equipment failure, roof leaks, etc. Documentation of as-built or post-restoration quality. Plumbing and building envelope water leakage. When doors, windows, or other openings in the structure are suspected of leaking. When performing an energy audit of the building to determine areas of infiltration and exfiltration. To determine adequacy of insulation. Wet insulation is a poor insulator but is a great conductor of heat. Infrared inspection of the roof can determine potential for water intrusion from roof leaks. Locating hidden leakage and/or dampness under resilient flooring. Mold can trigger asthma and other serious Health problems -- but it's also risky to your financial health. If you are buying a HOUSE, that has had ANY WATER problems, get it inspected for MOLD. Charles Perry: Member of the Mortgage Bankers Association's Mold Task Force says! "Homebuyers can protect themselves from future financial disasters, whether they're building a new home or buying an older one. For existing homes, homebuyers should get a mold inspection.” And as for new homes, Perry says, "Homebuyers should make sure the builder is using mold-resistant dry wall and other materials that keep mold from spreading."